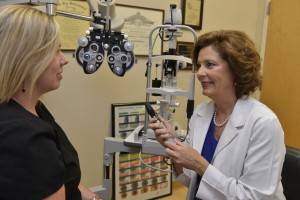 At Miller Vision Specialists in Greensboro, NC, we provide a variety of eye care services. Starting with a comprehensive eye exam, our optometrists’ will do a complete work-up including eye tests and screening for different types of eye diseases. Some of our advanced testing includes Visual Field Testing and Corneal Mapping. If you have diabetes, you can read more about our Diabetic Eye Exams below. 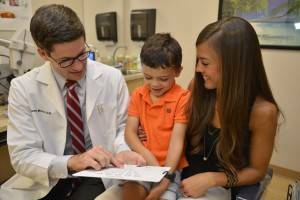 In addition to comprehensive and diabetic patients, our eye doctors’ also examine children. If your child is having a hard time in school, whether copying from the board, sitting still for reading or a number of other behavioral and academic problems, the cause could be vision. Bring your kids in for a yearly eye exam as soon as possible so that our staff can determine if their problems at school stem from vision issues. All of our eye exams are done by optometrists who are Doctors of Optometry. A Doctor of Optometry is licensed to evaluate and treat eye problems such as inflammation or poor vision. They can prescribe specific medications, corrective eyewear and contact lenses and refer you for eye surgeries. At Miller Vision Specialists we also treat a range of conditions such as glaucoma, the diabetic eye, dry eye syndrome, and macular degeneration. Our doctors’ work together with ophthalmologists to provide you with optimal eye health. To schedule an eye exam at our Greensboro office on Lawndale Dr, click here. For additional services provided by our talented eye care professionals, click on the links below. Read about different eye conditions such as astigmatism, dry eyes, and computer vision syndrome – about their causes and symptoms, how they are diagnosed, and how we can help you manage these conditions in our Greensboro office. Read about different eye diseases such as cataracts, diabetic retinopathy, glaucoma, and macular degeneration – about their causes and symptoms, how they are diagnosed, and how we can help you manage these conditions in our Greensboro office.